Yeah...the diagrams are confusing as one shows interconnections between NIC, SATA, and PCI-E lanes. But that does seem to be the case, four Gen 1.0 PCI-E lanes to the A1222's video card slot. Which limits it to 1000 MBs, or less than half the bandwidth of AGP 8x. To put this in perspective, the X5000 has twice that bandwidth, or almost the same as AGP8x. Obviously our current G5's have AGP 8X's bandwidth. The 11,2 G5 has twice the bandwidth supplied to its video card slot than the X5000. Raptor Engineering's Talos II's video card slot, on the other hand, has slightly more than twenty-five times the bandwidth of the A1222 video card slot, and its spec exceeds the capabilities of current video cards. Over three years later and still "on schedule and rocking". I wonder how many X1000 buyers still have faith that they will receive their free upgrade to an SMP enabled OS4.2 (at least in their lifetimes)? > between NIC, SATA, and PCI-E lanes. It's the one I referenced on the other websites, yeah. But you would think that they would have included the info in the technical documentation instead of a brief promo pdf. Still, 1000MBs is pretty underwhelming. Even Han we Ruiter has admitted it's going to limit what cards the A1222 will work well with. Then again, if they get drivers for the RX550, even if it's cpu limited, they will have a low power draw combo. Not that the X5000/20 draws that much more power, and an RX560 would work well with that. > technical documentation instead of a brief promo pdf. It definitely is in the reference manual and probably also in the data sheet, but both documents aren't accessible without NXP account. 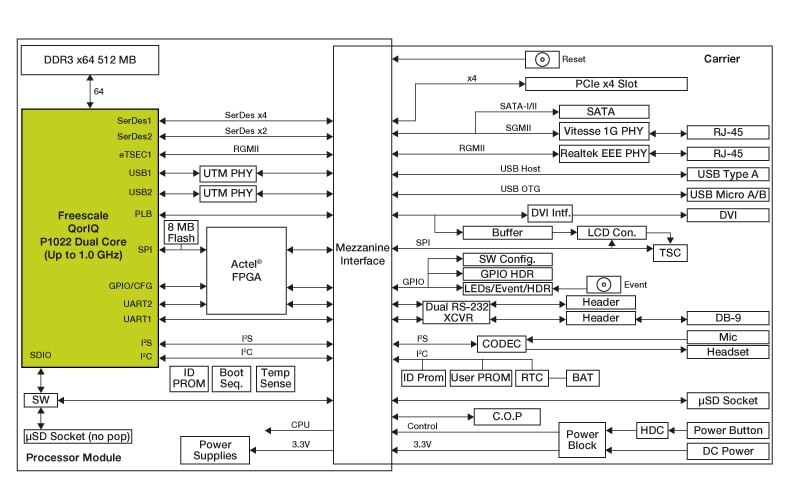 And while the detailed block diagram is in the publicly accessible fact sheet, I had never bothered to look there as Freescale/NXP fact sheets usually contain the very same block diagram as shown on the product web page (which isn't the case with the P1022 fact sheet and product web page, apparently). > will work well with. You mean it will work worse with high-end cards than with low-end cards? I have access to those and can send you copies, I'd didn't see that diagram anywhere else. >> will work well with. >You mean it will work worse with high-end cards than with low-end cards? I probably worded that less accurately than I should have. He seemed to think that some users would find the system more appropriate for something like an R5 240. I'm curious to find out how it will scale, under a more complex OS it wouldn't, but I would think that with the limited use of gpu hardware that Amiga like OS make that a faster gpu and memory would always be better. And the bandwidth limitations are the same for all cards. That slow a cpu combined with this bandwidth limitation would make higher end cards cpu limited under something like Windows. We won't really know how this hardware will perform until we see this hardware in the wild, but Hans did say he's not giving up his X1000. But my guess, an Rx550 or Rx560 might work, but something like an Rx580 would be a poorly thought out investment. You know, save the extra money, and buy a better system. All this just makes me more curious how a 11,2 G5 would perform. Better cpu, more PCI-E bandwidth, more efficient memory controller than an X5000 (let alone an A1222). > I'd didn't see that diagram anywhere else. Block diagrams alone aren't proper technical documentation anyway. Such things have to be (and surely are) properly documented in text form in the reference manual (and data sheet probably). Funnily, that P1022 SoC diagram is shown on the P1022DS board product page as board diagram. 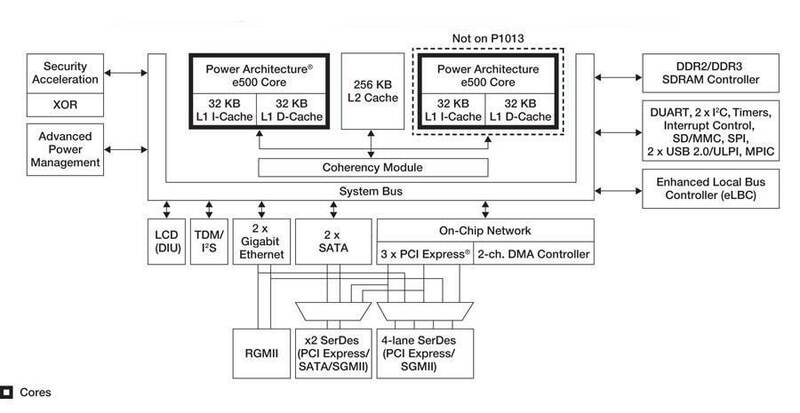 The real P1022DS board diagram is missing (that's why I linked it from another source above). > for something like an R5 240. "Polaris cards cover the full range from low to high-end, just like their predecessors." Of course they do, its not like the A1222 is the only system that you could use a Polaris card in (and there are lower end cards), and if someone wants to pay as much for their video card as the do for their board, isn't that up to them? Rationality or economic sense never dictated anything in this community. I just don't think a P1022 will drive a high end card as well as a more powerful Soc. I'm pretty sure that contention is provable, but I don't know how you'd separate the performance improvement of the more capable, faster cpu, from the higher bandwidth interconnects provide by the Soc. If this is anything like other OS', as resolutions scale up, even with better video cards, the less competent processor is going to see diminishing returns. Better performance, but gains throttled by cpu limitations. At this point 1080P resolutions are kind of expected by the general public. How well do you think an A1222 will do at this resolution? No matter what you put in it. >>> more appropriate for something like an R5 240. >> from low to high-end, just like their predecessors." > do for their board, isn't that up to them? I meant it the other way round, namely that he seems to think that there are GCN4/Polaris cards low-end enough to be a good fit for the P1022 so that the P1022 isn't (much of) a bottleneck for the graphics card. Yes, that's why there a low-end GCN4/Polaris cards. > provide by the Soc. The typical test case to separate the influences of CPU and GPU on the overall performance result would be to test each CPU with each GPU, i.e. 4 combinations in case of 2 CPUs and 2 GPUs. The result depends on how well the 1.2 GHz e500v2 (one core for Amiga-like OS, two cores for multithreaded games on Linux) can cope with the required calculations for the game logic, which are independant from the resolution. This is assuming the resolution is below the resolution where the fill rate of the GPU is reached (otherwise the GPU becomes the bottleneck). The result depends on the UVD support of the OS. An OS with UVD support like Linux will do fine even with a low-end GPU. An OS without UVD support (as well as for the 2nd CPU core) will do badly even with a high-end GPU as not supporting UVD means the CPU will have to do the H264 1080p decoding which a single 1.2 GHz e500v2 core cannot do in realtime. >I meant it the other way round, namely that he seems to think that there are GCN4/Polaris cards low-end enough to be a good fit for the P1022 so that the P1022 isn't (much of) a bottleneck for the graphics card. Yes. That's the better way of framing it. Honestly, were it not for the non-standard fpu, the e500v2 wouldn't be that bad. The integer performance of the A1222 should be better than previous AMCC based boards. But with our established based of dirt cheap G4 equipment, that fpu issue is a deal breaker. >This is assuming the resolution is below the resolution where the fill rate of the GPU is reached (otherwise the GPU becomes the bottleneck). Yes, that is the relevant qualifier, I'd assume A1222 owners would use video cards with relatively recently generation gpus (at least GCN). From what I've seen, there is enough of jump in performance at the bottom end for that resolution to be practical. That why I agree with you that we need to move to support GCN, for the low end boost. The jump from R5 230 to R5 240 is much bigger than the numerical change would seem to indicate. The problem that will pop up IS with video decoding. One core at 1.2 GHz without gpu assist and like most of the low end Qorlq Socs, no AltiVec? Our G5s struggle with HD video. Full screen video at 1080P resolutions on an A1222 seems virtually impossible. I wonder how well that is documented under Linux. That's a given as it must be GCN to be 3D-supported by OS4. I can even imagine that A1222 will be sold with GCN4 cards, assuming that Polaris support will be released before or together with Tabor. > I agree with you that we need to move to support GCN, for the low end boost. > The problem that will pop up IS with video decoding. 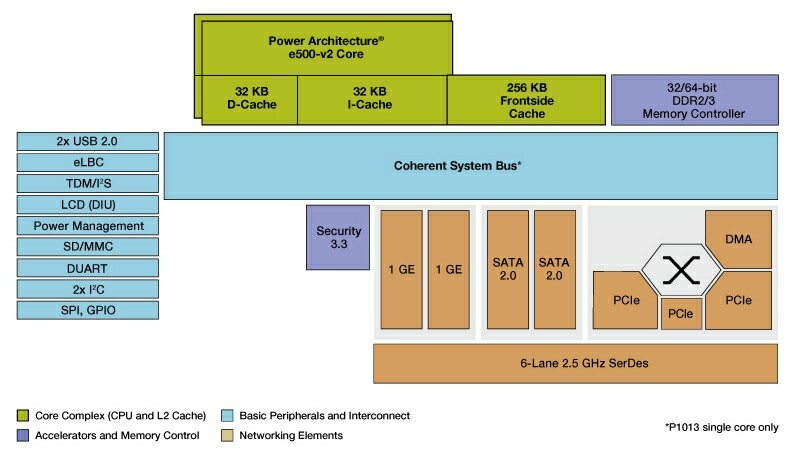 Actually, AltiVec is missing from all low-end, most mid-level and some high-end Power Architecture QorIQ SoCs. > Our G5s struggle with HD video. Depends on the actual HD resolution. At least 720p should always be fine on G5, even using only one core. > Full screen video at 1080P resolutions on an A1222 seems virtually impossible. Yes, with OS4 there's no way this can be done using a modern codec, no matter if played full screen or windowed. > UVD support? I wonder how well that is documented under Linux. That I wasn't aware of. So two foreign packages required, Gallium3D and VDPAU. That explains the resistance to gpu assisted decoding. Importing more code from the UNIX/Linux world? I don't like the idea either. And the entire video driver library would have to be rewritten or replaced. Interestingly I am getting about equal 1080p playback performance with local videos on my X5000/020 under AmigaOS 4.1 FE with Emotion video player and the composite comp_yuv2 output with a Radeon R9-270X and under Linux using a Radeon FireMV 2260 pciex1 in a pciex1 slot with hardware assisted video playback. I am able to playback 1080p avi and mp4 videos with frame skip enabled . 1080p mkv's are a problem for both OS'es . 720P playback is better with the same setup under Linux. Youtube videos can be streamed ok.
At least we know the 64 bit hardware will perform reasonably well. 1080p mkv performance seems to vary from file to file on a G5, but again 720p is consistently good. As on the A1222, its fair to say that a T10XX cpu based solution might have had issues with higher resolutions as well (although it would have some edge). And to be a complete trouble maker, even without UVD, even limited to a single thread, a Power 9 cpu ought to be able to handle 1080 mkv files. Hardware is where it's at for decoding video, I'm afraid. Throwing your CPU at them is a losing battle. I've got an old media player based on a 300 MHz MIPS CPU and 90 kB of RAM, which plays 1080p videos of almost any codec, bitrate or container with its Sigma decoder chip. MKV Blueray rips? No problem, as long as the bitrate isn't insane or they don't use some weird codec like Hi10P. The RaspberryPi can play almost all the same 1080p just fine, assuming the I/O bottleneck doesn't get in the way. The Pi 3 can handle 60 mbit bitrate 1080p video no problem. Again, due to hardware support built into the Broadcom SoC. Same with an old Android box with an Allwinner A10 Chinese ARM ripoff I own: single core, 1 MHz, plays 1080p fine, even across a LAN; the Mali GPU does the hard work, or at least I think it's a Mali. Software only, an i5 or even a slow i7 might struggle to play the same videos without hardware support. It's becoming ludicrous, because any graphics card or APU within the last decade should be able to play 1080p, and here we are with people running out and buying the best spec Radeons supported, that they'll never use even the basic hw codec support on. Basically, yeah, that about sums it up. Without full documentation of the decoding hardware we have to rely on porting an existing solution, or use the cpu. The Pi has one of the few fully documented gpus used on an ARM cpu. Android and proprietary Linux drivers on other systems rely on code provided by the hardware manufacturers. Same with Windows and MacOS. Even with the hardware UVD support on PowerPC under Linux there appears to be a problems with 1080p decoding . At least on the X5000/020 . I was not seeing any better performance with a Radeon HD6570 in the pciex16 slot as the FireMV 2260 in a pciex1 slot. Issue could be in hardware or software. Under AmigOS 4.1 the higher end cards give a boost with video playback with the composite comp_yuv2 output. Also the Polaris cards have a much better composite performance for larger rectangle sized manipulations(Have not tested video playback on the X5000/020). A couple of 5% increases in performance such as the Radeon HD 3.x driver and a video card that has a better composite performance makes a big enough difference to be able to play 720P video well without altivec on the X5000/20. Edit: I am also getting decent performance with 1080p MP4 videos . That was an interesting 5 minutes read through the last few posts. As an end user the thought wouldn't even pop into my head that there might be a debate about how well a £1700+ computer (X5000) could play video in 4K, let alone 720p or 1080p. Frankly, I wouldn't expect there to be an issue on the cheaper A1222 either, although maybe not 4k. Fortunately I don't have any 4k screens but that won't be the situation forever. Windows is already a major pain when it comes to mixed scaling so it had occurred to me to get a 4k monitor. Of course that alone doesn't mean I need to play video at that resolution of course! I was going to pull the trigger on a Tabor the minute they were available because I've always wanted an OS4 system but am not prepared to shell out for the X5000. This thread has certainly made me question that. Unless you plan to use any Amigaoid powerpc system and OS as your only system then you should not use the video playback yardstick as the only criteria. I enjoy my Sam460ex + AmigaOS as well. Video playback would be seen as this machines weakness. I watch a lot of videos on this machine. I just re encode them to a smaller xvid avi format at high bit rate using a PC and transfer them to the Sam460ex via FTP. Quality of the playback with these is excellent. About 6 Minutes to convert a 45 minute video and can do 5 videos at a time. The default playback quality using emotion video player on the Sam460ex is much nicer than on the basic PC setup. >> I am able to playback 1080p avi and mp4 videos with frame skip enabled . > Cool. At least we know the 64 bit hardware will perform reasonably well. I am starting to experiment with complete videos 40+ minutes rather than just short clips. Seem to be able to play back 1080p mp4 without frame skip enabled in Emotion video player. Will verify and report back . > that they'll never use even the basic hw codec support on. > pciex1 slot. Issue could be in hardware or software. What's the CPU workload in these cases?